Do you need urgent medical care but are far away from a hospital? We’ll bring the hospital to you! At least, that was the futuristic idea behind this edition of the newspaper comic, Closer Than We Think. And while it still feels a long way off, there are signs that we’re slowly but surely moving into a direction where drones can help deliver medicine to people in hard-to-reach areas. Produced by commercial artist and illustrator Arthur Radebaugh, Closer Than We Think ran in hundreds of American newspapers from 1958 until 1963. Radebaugh’s comic strips tackled everything from high-tech school desks and electric cars to weatherproof domes and jetpack mailmen. 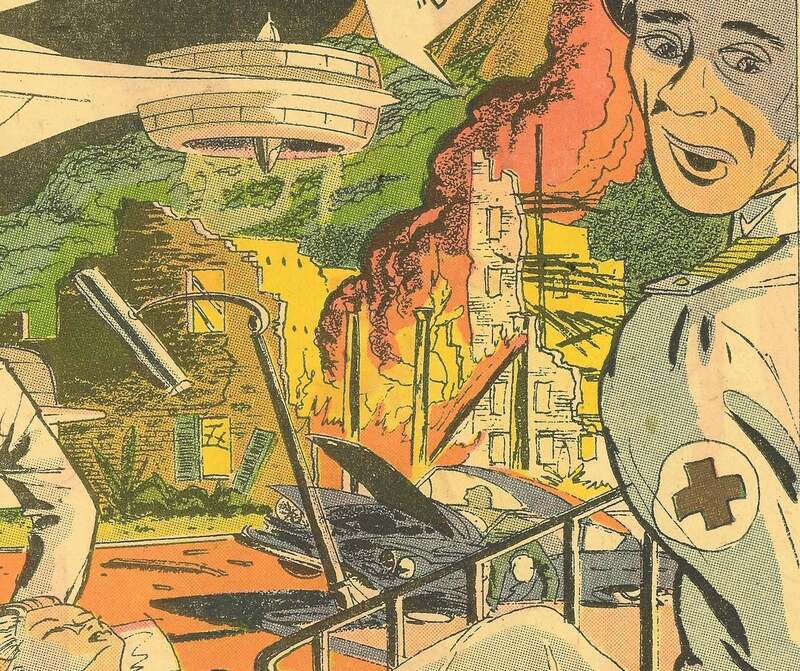 But the 10 April 1960 edition of the Sunday strip looked at the future of medicine and ways to deliver medical care in remote areas. Remote areas that were bombed out and destroyed, by the looks of it. If that concept for bringing medical attention via the skies rings a bell, it might be because earlier this week UNICEF partnered with the government of Vanuatu and an Australian drone company to make a historic delivery. A one-month-old named Joy Nowai became the first person ever vaccinated through medicine delivered via drone. And while they didn’t bring an entire hospital to Joy, it was a step in the right direction. Lightweight, prefabricated hospitals will be flown to war fronts or disaster areas in the world of tomorrow. In fact, the U.S. Army is already planning such a project. One means of transport might be a nuclear-powered helicopter—a goliath almost as long as a football field, weighing half a million pounds. Even more advanced, however, is a concept for an enormous flying saucer, held aloft by massive “dyna-props” similar to those used in the new “flying carpet autos” or “levicars.” Such air vehicles would not only move hospitals—they could actually serve as flying hospital ships as well! Of course, the medical care that’s delivered in this strip is a bit more labour-intensive than a simple vaccine delivery. They imagined bringing the entire hospital to a remote location. And there are already versions of this, thanks to planning by the US military for battlefields around the globe. But the military is more and more concerned with offering telemedicine—that is, setting up remote links that allow interaction with a patient without a doctor actually being onsite. One question that’s never answered: If your entire hospital is floating, how do you perform surgery with a steady hand? I’m sure we’ll have figured all those nasty details out by then, right? The vast majority of Closer Than We Think looked at the shiny, happy, optimistic futures that we so often associate with this period. But there were times when the strip went dark by necessity. This, below, was obviously one of those times. Take a closer look at the far right in the panel. It’s never explained what happened. But whatever it is, it’s not good. Given the nuclear concerns of the time, we can probably guess what’s suggested. The godless commies nuked an innocent American town and started World War III, yeah? If you want to learn more about Closer Than We Think, there’s a great documentary about Radebaugh and his work, produced by Brett Ryan Bonowicz.